If you discover a leak in your roof, or if your roof should suffer damage in storm, make Crown Residential Roofing your first call for expert roof repairs. No matter how small the leak, it is important to make repairs as quickly as possible before water has a chance to enter your home. Water that seeps, drips or flows into your home through a damaged or worn roof can cause significant structural damage. Walls, ceilings, rafters, foundation – all can be affected. At Crown Roofing we make repairs both small and large, quickly and efficiently, to help prevent further damage to your home. For a minor leak – which can still cause major damage – we have the experience totrack down and identify the source of the water intrusion, then take steps necessary to restore the integrity of your roof. In more than 100 years of roof repair and roof installation in Surrey and Vancouver, we’ve stopped thousands of leaks! Big Damage Can Pose a Big Danger! For more serious damage, including roof penetrations caused by falling branches or storms, it is important that you not attempt to make repairs yourself. Standing on a wet and slippery roof in the middle of a raging storm is not the place you want to be! Leave it to our roofing professionals. Make your first call to the experts in residential roof replacement that Vancouver trusts for fast, reliable repairs. Our crews will make temporary repairs to help prevent further damage. Once the storm subsides we’ll return to assess the damage done and recommend further roof repairs or replacement. Providing your roof with proper care and maintenance will help extend its service life and ensure that your home is properly protected against the rain, wind, snow and ice that make up our British Columbia weather patterns. As the most experienced company in residential roof replacement in Vancouver, we know what it takes to keep your home’s roof functioning properly. Inspect your roof yearly, being alert for missing, cracked or curled shingles and other signs of wear. Keep your roof clear of debris, leaves and pine needles. Remove moss and clean mold or mildew. Keep gutters clean and clear all year long. 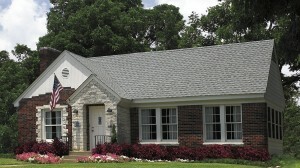 Have your roof inspected every 3-5 years by a qualified expertfrom Crown Residential Roofing. For a new roofing system or roof repairs in the Vancouver BC area, trust the professionals of Crown Roofing LTD. With over 100 years of experience and thousands of successful roofing projects we’re the experts in roofing Vancouver homes and businesses. Contact us today at 604-370-6288 or by completing our convenient online form to schedule a free roof evaluation and estimate.